Verb trans. Late 16th century. 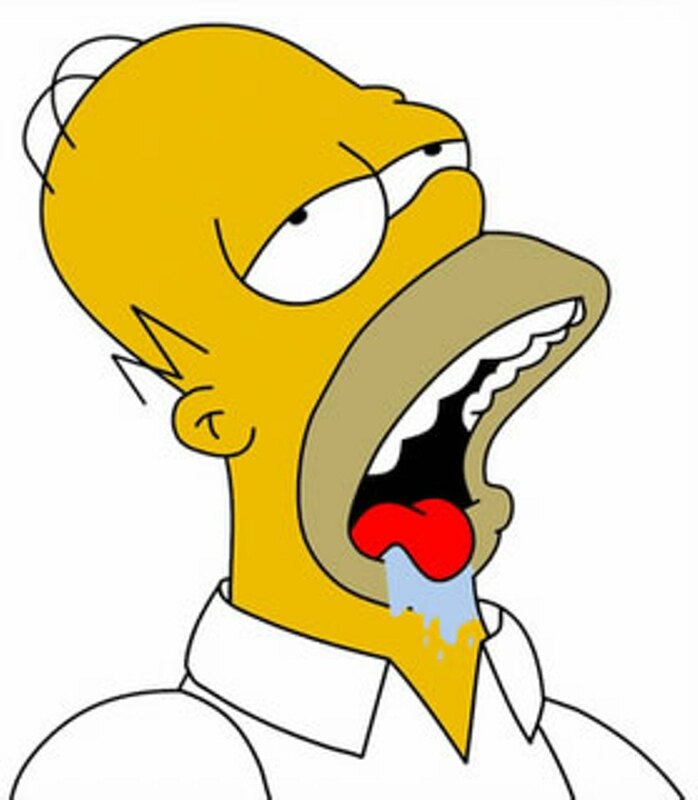 Not only does the mere mention of food make Homer Simpson beslaver like a St Bernard, the mere mention of something that could possibly be construed as sounding a little bit like a food can set his salivary glands a-churning (such as D'oh! and Nuts! said in tandem). We shouldn't be quick to judge him, however, as the average adult generates between 2 and 4 pints of saliva per day and it has to go somewhere. This, I should point out, is a very useful fact to know for the next time a globule of spittle reaches escape velocity mid-conversation and lands in someone's eye. Honestly. Try telling them that. It diffuses the embarrassment every time. A few years ago, whilst I was daydreaming on a door-to-door voluntary work, the householder opened the door suddenly, caught me entirely by surprise and my hurriedly-summoned "good morning" was accompanied by the polo mint I had been sucking on with ruminant thoughtfulness, which, having also been taken by surprise, looked back at me dolefully from the tie of the householder it was now slowly sliding down. This comment made me choke on my tea. It kind of validates The Butterfly Effect, because that simple and inept 'Good morning!' all those years ago, while overtly and immediately putting a polo mint on that man's tie, also spattered Earl Grey across my t-shirt. In my humble opinion, I think this word would've been much more amusing, were it "beslobber" instead. As for the 2 to 4 pints of saliva a day, I'm not surprised. Ever walked behind a troupe of "cool" 15yo boys? Or rather, swam behind them? Because puberty seems to be the age around which boys forget how to swallow their saliva, and have to spit it all around instead. Psst ... Bibi ... *whispers* ... I think you'll like tomorrow's word ... ssh! Bibi! Spoiler alert indeed! Not that I'm saying you're right, of course. You might be. Ssh!